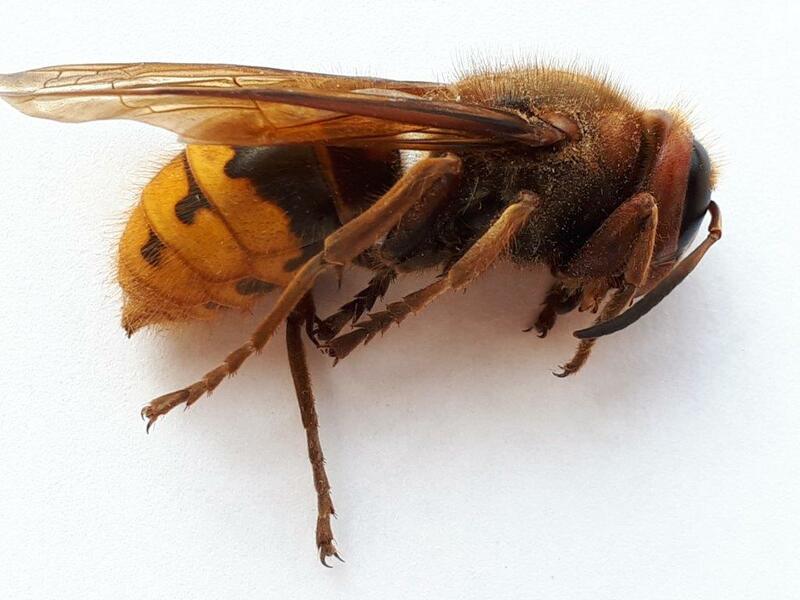 Other Bees and Wasps – Dr. Bug – Urban Pest Control Ltd. 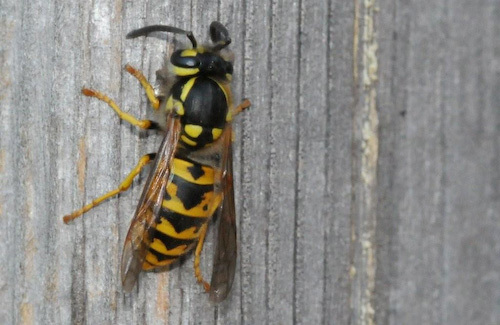 The most common in Ontario are yellow jackets, bald-faced hornets, paper wasps, mud daubers, honeybees and Bumblebees. Fall is the time when the nests of bees and wasps reach their peak size. They have been busily building their nests all summer and their population sizes are now at a maximum. Are they bees, wasps or hornets? This is a question that many people have difficulty answering. In one respect, it doesn’t matter as they can all sting and who is going to stand around trying to identify what kind they are when being chased by an angry swarm. For control though, it does make a difference and knowing what you are dealing with can make the job easier (and less hazardous).The most common ones that we encounter are yellow jackets, bald-faced hornets, paper wasps, mud daubers (all four are wasps), honey bees and bumble bees. 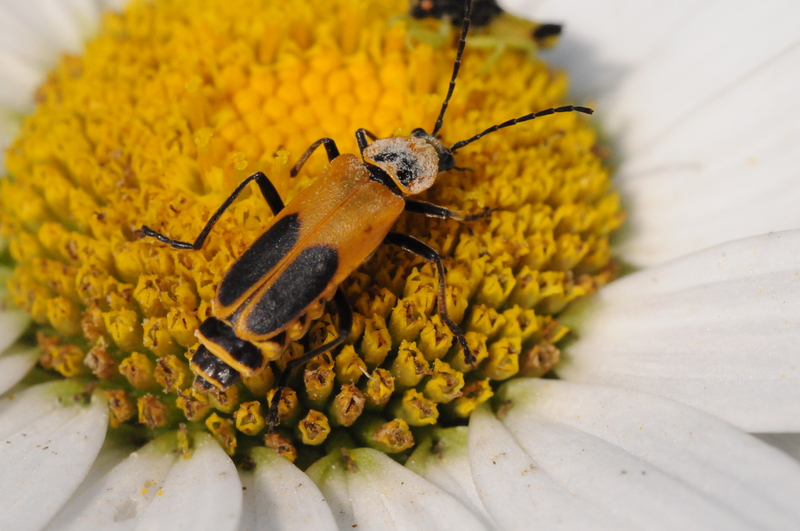 Are probably the most common of the pest wasps. They build the typical football shaped nest that you see hanging from tree branches and under the soffits of houses. They will also build their nests in the ground, stumps, wall voids, attics and a host of other often unexpected places. Nests begin from a single queen each spring and completely die at the end of the season. They are not used again the following year. Bald-faced hornets are black and white and are larger than most yellow jackets. Wasp nests can get quite large. I removed one from the false ceiling of a high school portable that was approximately three feet long by two feet wide. Nests consist of a single queen and sterile females that are the workers. 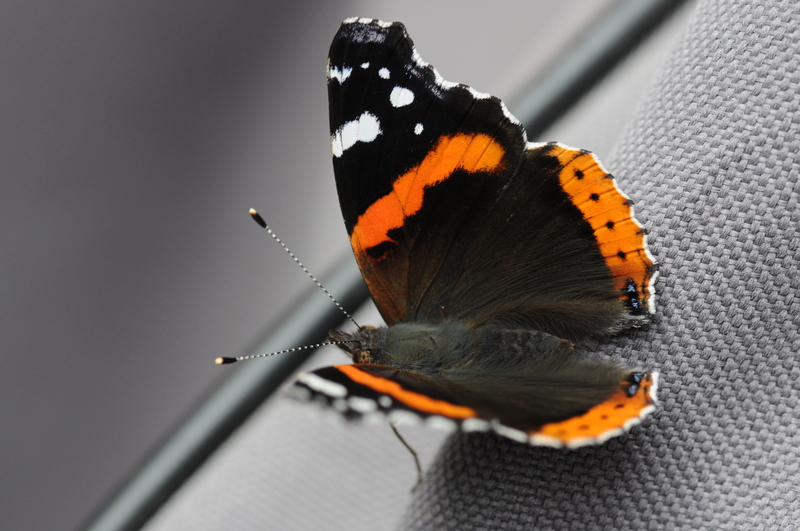 In the late summer, new queens and males are produced which leave the nst and mate. The queens then try to find places to over winter. Those that survive will start a new nest the following season. 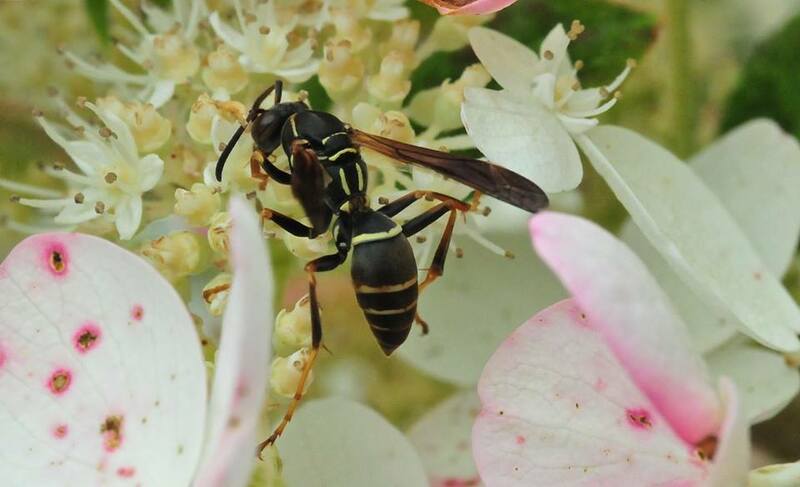 Paper wasps are large, dark wasps with long legs that dangle when they fly. They build open nests that resemble small upside down umbrellas and are usually found up in the soffit and dormer areas of houses. They often build nests in garden sheds and occasionally liven up the first bar-b-que of the season by building under the lid. My record is removing 64 nests from a single house. 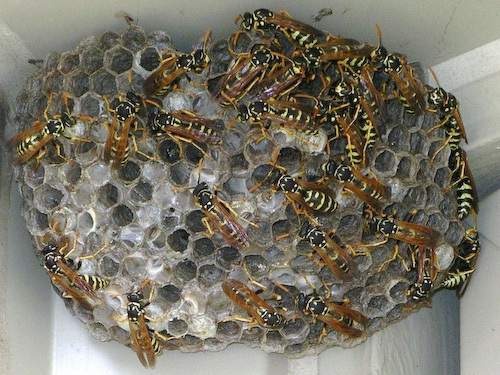 Paper wasp numbers can become quite large, as the queens tend to overwinter in the attic and build their nests on the same house next year. 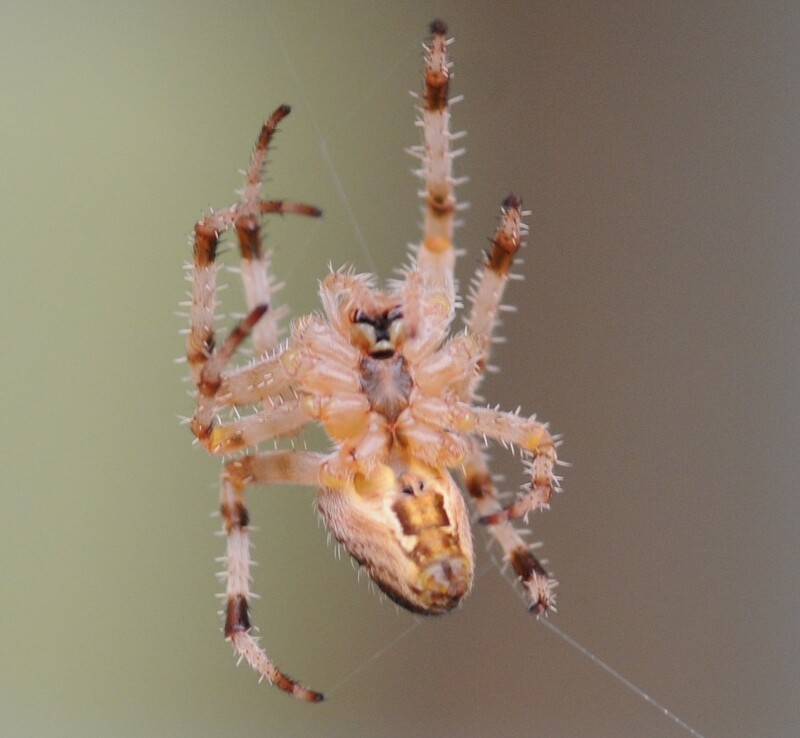 Most daubers build the mud nests that you often see stuck on the side of the house or under the eaves. 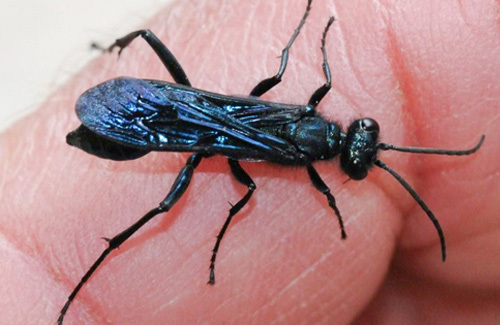 These are solitary wasps and are often shiny black or blue in colour. Honeybees will also sometimes build their nests in homes, either in walls or attics. We occasionally encounter homes that have had the same nest for many years, as honeybees do not die in the fall. There are cases where the honey in the attic has become so heavy that it has fallen through the ceiling into the room below. It is my experience, that if a honey bee nest has been in a home for many years and then is eliminated, new swarms return to the old nest in succeeding years. Bumblebees are large, hairy and black and yellow in colour. 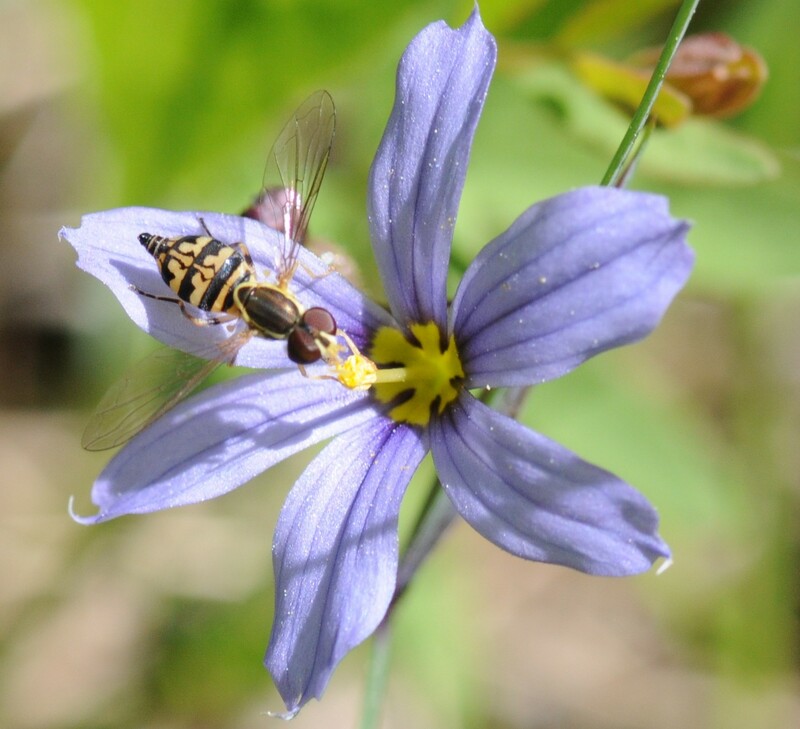 They are good pollinators like honey bees and do not usually cause a problem. Sometimes however they build their nests in houses in areas such as under porches or in crawl spaces, garages, wall voids etc. They will often nest in insulation. They do not produce honey in the same way as honeybees. Their nests consist of a grouping together of large waxy cells and may contain several hundred individuals. 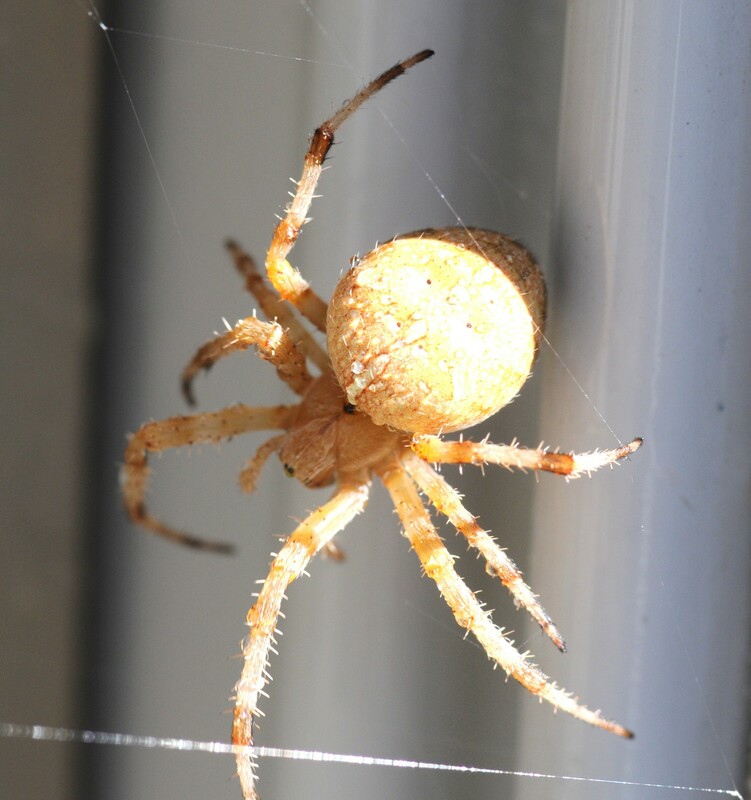 There are numerous “home remedies” for eliminating wasp nests. One of my favorites is a man who tied the end of his vacuum hose just outside the entrance to a yellow-jacket nest, turned the vacuum on and let it run until he had sucked all the wasps into the vacuum bag. I take no responsibility for your vacuum cleaner motor if you try it.